Occasionally I run across pictures that are just so odd I can’t come up with any narrative that explains what’s going on. I know where this weirdly mismatched group is: by the old field house. And I know the year: 1929. But I have no earthly idea what the story is. And whose hat is that? It’s just as weird this way. Well, it appears to be reversed, and the man in military uniform has a badge that looks like the Greek letters lambda mu sigma. Have don’t a check to see if that means anything. Well, it looks like there is a lambda mu sigma fraternity. The letters look more like “Lambda Mu Omega” to me. it could also be “A.M.O.” or, less likely, “A.M.I.I.” I’ve not found any insignia that matches any of these. Is that a pipe sticking out from the top of the boot of the guy in uniform? It sure looks like it, doesn’t it? I think the letters are more likely U.S. with the S accidentally turned sideways. Yes, that could be a mishmash of pre-and-post WWI US Army officer uniform pieces. The hat looks like turn-of-the-century with a faded spot where the officer’s uniform eagle was; the shirt and tie are approximately WWI period, and the jacket could be the new olive drab service coat circa 1925 or it could be a British-inspired aviator’s jacket from WWI. The pocket design is consistent with the 1925 coat. The trousers and boots are also plausible. Note that the uniform is in poor condition: there appear to be bleached spots on the fabric as well as spots on the negative (although the man in the dark suit has similar spots so it could just all be photo artifacts.) and the sleeve cuff is frayed. The insignia could be individual U and S with one turned sideways or it could be the earlier U S V of the Volunteers upside down. I can’t really tell; neither is even close to regulation. The model is wearing one glove and holding the other in his bare hand. The photographer has probably asked the seated gentleman to hold his rather nice light-colored hat so he doesn’t have to put it on the ground while ducking under the hood of the camera. I’m not completely convinced that the guy’s sweater reads “1929” but it could. In any event, he has a rather bold silk tie for the time, and a prominent cowlick on the back of his head. That’s all I can see. 1) The brass letters on the uniform are “AHQ”, which could stand for “Army Headquarters” (an approved abreviation in WWI: http://freepages.genealogy.rootsweb.ancestry.com/~gregkrenzelok/veterinary%20corp%20in%20ww1/WW1%20Army%20Insignia%20Identification.html). 2) The frayed cuff may instead be a fleece-type lining of the glove being worn on the soldier’s left hand. It looks like the bottom of the glove overlaps the cuff of the left sleeve. 3) There are numerous spots that appear on the negative, especially the right side. If they’re not the cause of the splotches on the uniform, maybe he’d been splattered by a passing car driving through a puddle or such? I’d think a soldier wouldn’t wear — or have his photo taken — in a poor-condition unitorm. 4) I think 1929 is most likely the year on the sweater, but 1925 is also possible. Sorry to be so incremental … but I keep finding new things. Might the fellow in the middle be Knute Rockne, the famous Notre Dame coach, for whom Jack Meagher had played? An article in the March 1, 1929, Thresher, mentions the possibility of Rockne’s visit … either before or after his travel to be a referee at the Texas and SMU Relays on March 29 & 30. However, there’s no other mention in subsequent Threshers about the visit,if it took place. You know, that’s possible. Although if it’s Rockne I can pretty much guarantee that his own hat is the one he’s holding rather than the one on his head. The hat on his head would have been seriously old-fashioned in 1929. Even Lovett had abandoned that style by the late 20s. That does look like Rockne. What looks like a pipe in the sock is part of the garter holding the sock up. We used to have those with the Boy Scout Uniform in the 60s, a little flag of cloth attached to the garter. on second thought, looking under magnification it does look like a pipe and not a garter. Maybe I should go to bed before I make foolish comments. No, I urge you to make as many foolish comments as possible. Why should you be any different from the rest of us?? Are the letters perhaps AMC, for Agricultural and Mechanical College? And perhaps the man is in the Texas A&M Corps of Cadets? My son is in the Corps now so that was my first thought. Actually, that is a very good catch. I think the letters are AMC, and the cap device looks like the A&M Corps device (or maybe where one was) And, yes, maybe it could be a fleece-lined glove. It’s true that AHQ was an authorized abbreviation but I can find no insignia with that. There were HQ insignia but they were on discs, not individual letters. I don’t see any Corps rank insignia, although there might be a chevron on the lapel. 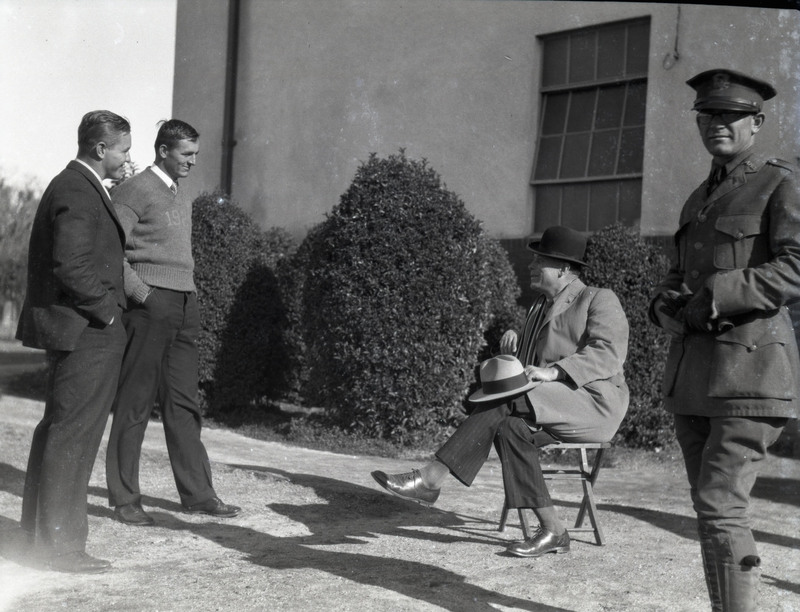 Perhaps the seated gentleman was a guest from Texas A&M and the cadet was his driver? Hard to say if he bears any resemblance, though. I do think that’s an Aggie. I think the cap device may be subdued, there are crossed rifles on his lapels, and the insignia reads AMC. Other pictures of Corps members at the time have the same insignia and rifles in polished brass. His insignia seem to be subdued (not shiny). He’s also wearing trousers which can be worn with boots (we see those little button things on other ROTC uniforms) but no boots, which makes me think he’s not a senior. (He tucked his pipe into a little flap that would be covered by a boot.) His right hand is ungloved but his gloves are heavy and the seated gentleman has an overcoat (duster?) and maybe a scarf. I think he removed his glove to shake hands, another indication that he is a guest at Rice. I think he did drive the seated gentleman to Rice, in cool weather in an open or touring (canvas top but no windows) car, which would certainly have been likely for a college student. Closed cars were still rare and expensive. The Corps today wears “AMU” brass on their collars today, in the same position this cadet is wearing his “AMC.” The university’s name changed from College to University in 1963. Here’s a very small photo of the AMC lapel badge and crossed rifles (in bright brass.) This was after the white shirt superseded the olive drab shirt in the late 1920s/early 1930s. I don’t know anyone there (I am not an A&M former student) but I can certainly forward this info to them to see if they respond! The A&M archivist said he would look into it! 1. It appears that his upper lapel are the letters AMC, which would be in line with a cadet uniform from the time. 2. On his cover (hat) it appears that the emblem is that of the Corps at A&M. 3. To my colleagues and my eyes is does not appear that there are is anymore brass on his lapel, after the notch. Cadets would have polished brass of the unit they would be in (crossed rifles, crossed cannons, crossed flags, two bars and a propeller). 4. The boots are not senior boots, senior boots are all leather and worn proudly in dress situations like this. It appears that there are leggings over the boots that the man is wearing. 5. To my eyes and my colleagues, this man looks to be too old to be a cadet. 6. He would not be a faculty/officer as these men had US brass where the AMC is at on the lapel and also had unit brass on their lapel. 7. My initial thought is that he is a former student. Looking through some of the yearbooks from the time period, one image appears that this man looks like E.E. McQuillen. Mr. McQuillen was class of 1920 and served as secretary for the Association of Former Students. Yet in other images of Mr. Mcquillen this does not appear to be him. One fairly distinct difference in the images appears to be the philtrum (skin under the nose above the lip). 8. In an earlier reply Carol brought up the possibility of Thomas Walton, I do not believe that the man sitting is him. 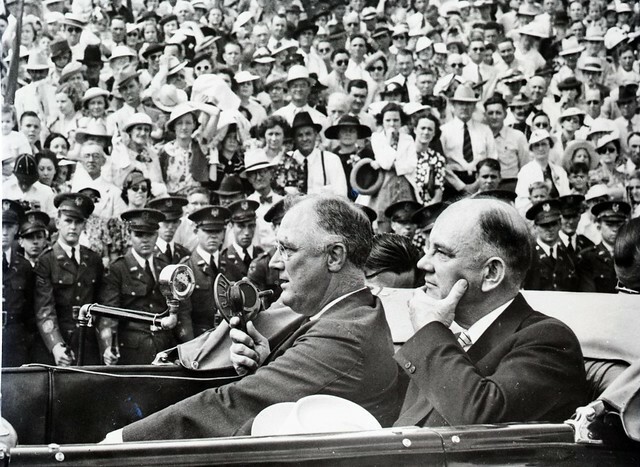 Here is a profile of Walton in 1937 in a car when FDR visited A&M. 9. Knute Rockne is an interesting thought. I don’t have access to the Rice yearbook or student newspaper to look through those and see if there is anything mentioned. Profiles are always hard to tell for sure. A quick internet search for Knute Rockne through Google pulls up images that appear to have Rockne wearing a similar hat that is in his hands. If you click on the image twice you get a pretty high-quality image. I’m trying to zoom in on the hat and lapel. I saved a copy of the image and tried to zoom in with photoshop and it pixelates. Melissa, are you keeping track of this thread? I’m trying to, in between meetings. Greeting from the Rice archives, Greg. I’ll send you a better scan as soon as I get a moment. Greg, thanks for jumping in. It looks to me like the uniformed gentleman has a pair of crossed rifles in subdued brass on his lapel below the notch. In general, all his insignia appears to be much less polished than are pictured in 1930s pictures. I’m not even convinced that his cap “stack” is even present, even though the outline, especially the curve at the top, is correct. Also, every 1930s picture of a cadet I can find has him in a white shirt; the dark shirts are a WWI/early twenties detail. And now that I look, I think it’s Rockne. There’s a genial character that seems to be present in a lot of the pictures, and that looks like his hat. I don’t know where the Texas Relays were held. But it would stand to reason that Aggies were there, too. Oh, sorry, the relays were already mentioned in a previous comment. The hat is making me re-question my comments earlier. On looking at it again I don’t know if that is the Corps “stack”. The right side doesn’t seem correct, as that would have a pretty straight line of the angled M.
And are there any circumstances in which a former student could appropriately wear his Corps uniform? Most of them would have gone on into military service, right? If I recall correctly, WWI soldiers could wear the uniform for something like three months after discharge but then only for really special occasions with a military character, like a Memoral Day parade. Or would he have been representing Texas A&M in some official capacity, maybe as a chauffeur or assistant to the seated gentleman? Good question Marty. I really don’t know that answer off the top of my head. As myself not being an Ag and only having been on the job for 6 months, I’m still learning here! If he isn’t an current student it brings up, why is he in uniform and why is he at Rice if that is Knute Rockne. Carol brought up the Texas Relays. According to the Longhorn the Texas Relays were in Austin. There was also a Rice Relays that was held in Houston. OK, I’m going to connect the dots, otherwise known as speculate wildly. I’m sticking with a lot of my story thus far. This is Rockne; the hat looks like his and it resembles him. We know there was a possibility he visited Rice near the time of the Texas Relays and he had a former player here in the person of Rice coach Jack Meagher. This was March and it was the football offseason; Rockne was quite the celebrity and traveled around the country a lot. 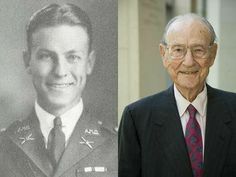 He was already, at this time, negotiating with South Bend automaker Studebaker to direct their marketing and Studebaker was considering a new, less expensive car named after Rockne. (it came out about the time of Rockne’s death in a plane crash in 1931 and got a lot of publicity from that, but was not a success). I think he is at Rice on a brisk March day (though warmer than South Bend) and the guy in the Corps uniform drove him over from Austin. Or picked him up at the train station and brought him to Rice. Or even flying from Austin is not out of the question at the time. I think the driving is more likely, given the heavy gloves. I do think the guy in the Corps uniform is a former Aggie from several years previously, given the pipe and the fact he looks older than a student. I think he wore the uniform partly out of collegiate pride and partly because it was the warmest outfit he owned. This was probably an unauthorized use of the uniform (and might also explain why not all the spots look like photo artifacts) but, hey, Houston is a long way from College Station and maybe people occasionally did that. I have a little more to say later but I think that’s pretty close to right. 1) Rockne had been invited to be a guest referee at the Texas Relays (Friday, March 29, in Austin) and the SMU Relays (Saturday, March 30 in Dallas). His visit to Rice would have been either before these events or afterward. So he would not have come to Rice FROM Austin. But might he have come down from Dallas to Houston after the meets, and possibly stopped en route at A&M … and then driven to Rice by the uniformed fellow? I’ve found no mention in subsequent Threshers of any visit by Rockne to Rice, although some early April humor (April Fool’s?) editions might have resulted in the lack of coverage. 2) The Thresher article mentions a possible dinner in Houston hosted by local Notre Dame alumni if Rockne visited. I checked contemporary issues of the “Notre Dame Alumnus” magazine (http://www.archives.nd.edu/Alumnus/) and found no mention of such an event. The publication seemed to include information on such local activities and Rockne’s honors. It would be good to check the Houston newspapers on or about March 31-April2, 1929, as surely Rockne’s visit and the dinner would have been noted as an item in the local, sports or society news sections. 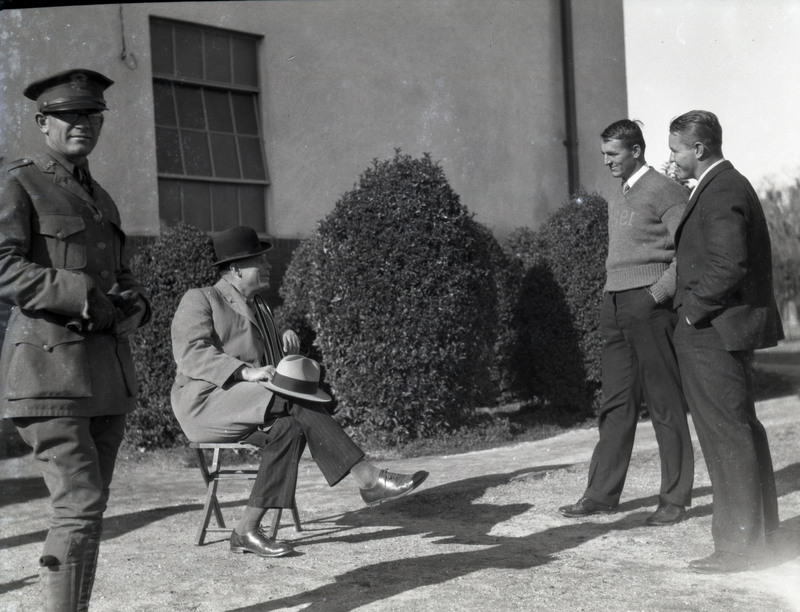 Also, I wonder if the light-colored hat might have been a 10-gallon-hat gift to Rockne from one of his hosts on the trip to Texas (if, indeed, the seated man is Knute Rockne). As Greg Bailey was the first to point out, there are lots of pictures of Rockne wearing a hat that looks like that. Lots and lots of them. That is one of the biggest reasons I think it is Rockne because the hat was so distinctive. I chatted with Melissa late this morning on the phone and she has some more info to post and she was going to check a few other sources that we discussed. From my end, I was tried to check the Battalion (A&M student newspaper) but it we don’t have any from March 1929. I was hoping if that was a A&M student there would have been a mention of him meeting Rockne and could get a name of him. As for the hat, I will say that it is a very common hat from the time period. The 1929 Longhorn (yearbook) had many students with the same style/hat in photos. In the mid-1920s there was a great football player from Port Arthur, TX named Christie Flanagan. He became a star running back on Rockne’s Notre Dame teams, graduating in 1928. In the March 9, 1929 edition of the Port Arthur News, there is a column called “Sport Casts” by Frank Bardon. Bardon says that Flanagan, back home in Port Arthur, has received a letter from Rockne wanting to meet with him when he was in Texas for the Relays. Bardon speculates that Rockne is going to encourage Flanagan to accept a likely offer from Rice to serve as an assistant coach to his old Notre Dame lineman and teammate Jack Meagher. According to Flanagan’s bio at the Museum of the Gulf Coast, Rockne actually asked him to become an assistant coach at St. Louis University for another Rockne alum, Hunk Anderson (also a former lineman, who became a line coach at ND and who went on to succeed Rockne at ND after Rockne’s death.) So we know for sure that Rockne was planning to come to the Gulf Coast area while he was in Texas. Bardon rhapsodizes about Rockne’s role in recommending Meagher as the Rice head coach, so it certainly seems possible that Rockne would have tried to visit Meagher if he was in the area. While I have nothing to add to the fine research above, I cannot omit saying that this post and all of the comments are absolutely fascinating. I am always amazed at the level of knowledge and sleuthing ability that are exhibited when puzzles like these are posed.